Sanderson MacLeod set to install production line by December, 2018. Rosie II name inspired by longtime operator who walked seven miles a day at her station. Sanderson MacLeod is the world leader in OEM precision guidewires and stylets for the medical and industrial markets. Sanderson MacLeod recently announced the planned introduction of a second Automated Stylet Machine work cell, to be installed in late 2018. Currently under construction, the machine was designed to produce fully automated closed-nose medical stylets up to 20 feet long. The machine was proudly engineered and built by Sanderson MacLeod’s internal engineers, partners and toolmakers. The new line will provide expanded capacity and unparalleled production controls for brush consistency such as fiber density, multistage overtwist capabilities and dimensional tolerances of up to a thousandth of an inch. Such automation innovations allow Sanderson MacLeod to remain the world leader in OEM precision guidewires and stylets for the medical and industrial markets. 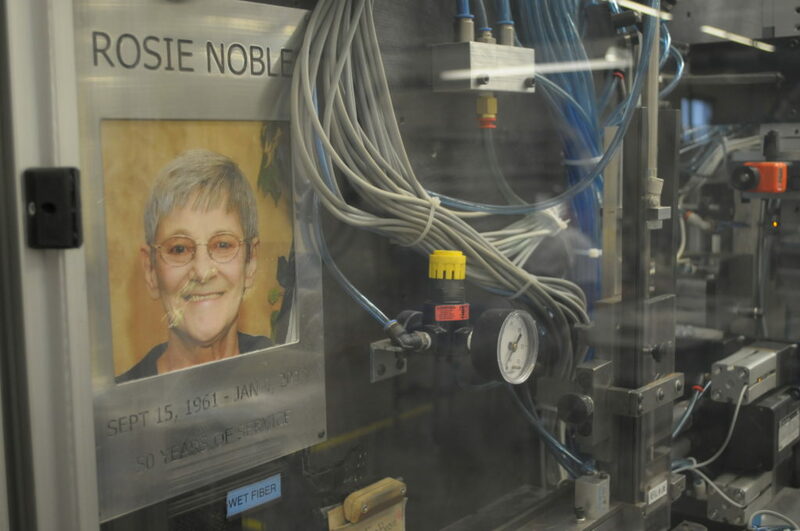 The machine cell has been named Rosie II, in further recognition of a recently retired veteran operator, Rosie Noble. When Rosie Noble retired after 50 years at Sanderson MacLeod, it was clear that it would be impossible to find a replacement for her. After all, she covered almost seven miles a day walking back and forth in 14-foot lengths making medical stylets. With her retirement fast approaching, a logistical problem became apparent; how to replicate the work she did everyday for 50 years. The engineering team at Sanderson MacLeod began brainstorming how to apply machine and brush making knowledge in order to assist operators to work faster and more efficiently. “Automation like the Rosie II is only possible when automation is built by people who clearly understand the end product and the various challenges its process requires,” said Mark Borsari, President of Sanderson MacLeod. “Our latest production expansion is yet another successful effort put forth by our engineering team and one they should be proud of. Not only will their efforts give our clients an edge in highly competitive markets, but it will further reinforce our dedication to patient safety through technically superior and consistent cleaning and sterilization products”. Automation is always a hot button issue in the world of manufacturing. Many see the word and think of layoffs and replacing current employees. At Sanderson, automation serves a different purpose… Technological advancements are utilized by our engineers to give our employees (some of the most experienced and talented brushmakers in the world), new proprietary tools and technology to do their jobs even better than before. It also allows them to spend their time on more crucial components of the brush making process, rather than spending most of their time walking seven miles a day back and forth on one machine, as Rosie once did. By giving Sanderson operators such a technological advantage, they are able to achieve higher and more predictable efficiencies. 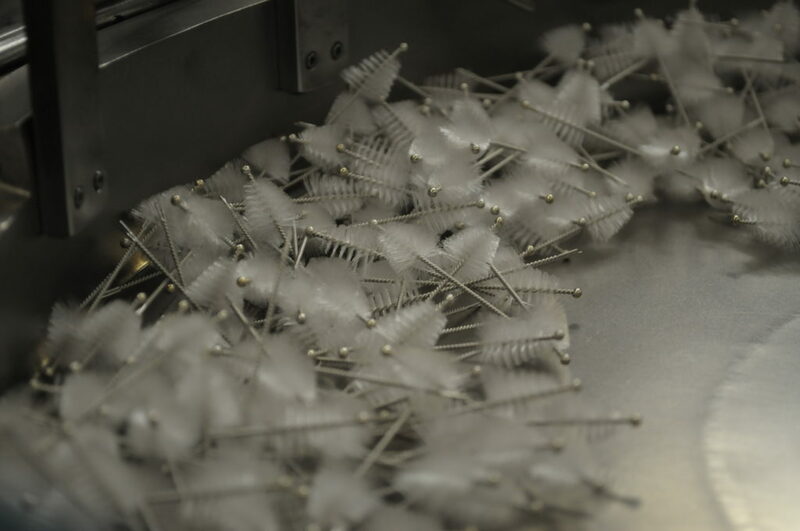 These new high capacity production cells are expected to reduce lead times and enhance product offerings including stylet assembly, protective systems and new product design options. The Rosie II is also capable of being interlinked to Sanderson’s automated Z-Tip machines to augment the existing product with a protective tipping process exclusive only to Sanderson MacLeod. The Z-Tip brush is an exclusive, proprietary innovation which created a new manufacturing process using high-energy, fusion-welding technologies. The result is an entirely new protective brush tip that melts the brush’s preconstructed core wire into a consistent, smooth and inseparable protective tip, known as the Z-Tip. The Rosie II is yet another example of Sanderson MacLeod reaching outside of the brush industry for inspiration to create proprietary automation solutions for those customers seeking cost effective, superior twisted wire brush solutions. Whatever happened to Rosie? Well, we still see her around town…Walking, of course. While the machine bears Rosie’s name, it also symbolizes the dedication and hard work the employees of Sanderson MacLeod, Inc. have put in over the last 50+ years.